Home › Sociology › gender & feminism › Pink and blue. I’ve been web-shopping. Pink and blue. I’ve been web-shopping. Wonder if it comes with a pink pacifier and bonnet, too? So really that’s just a god-send, that pink scooter. It will remind people you have ladybits while still not looking inappropriately adult. 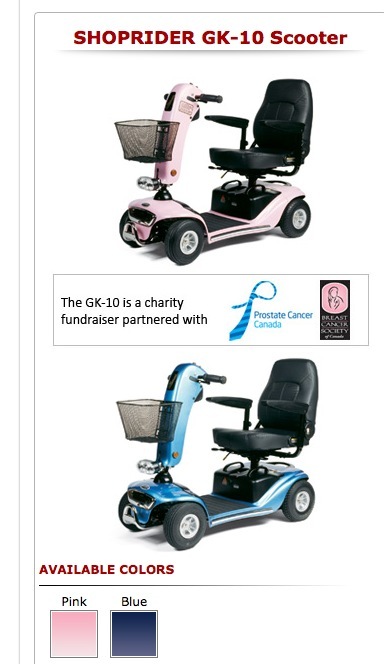 And … women only ever want pink scooters and to support breast cancer research, and men only ever want blue scooters and to support prostate cancer research. How’s that dividing&conquering of the genders working out for ya, patriarchy? By the way, if anyone actually has this scooter or the GK9, preferably in zingy metallic red, I’d love to hear from you. Or if you know of good scooter vendors in Perth who bring them to your house to test-drive and comparison-shop, all the better. Red is good. Espresso is better! grendel’s last blog post..Coffee we can believe in! Breast cancer is the first refuge of people who want to pose and look nice for “giving to charity” but don’t actually care enough to research into which causes might appreciate the help or which charities are best to donate to. Nah — just default to Komen, slap some pink paint on (whatever), donate some miniscule amount and reap the benefits for being a “socially conscious” corp. This is my scooter. Unlike my old one (similar to your picture) which wasn’t waterproof, couldn’t be stored outdoors, was an incredibly rough ride couldn’t get over kerbs more than 2 inches high my Supersport goes cross country, for 30 miles at a charge and has full suspension. The old scooter was breaking down and being returned to the dealer for repair every six weeks and the tiller snapped off completely FOUR times, whereas I I have just replaced the batteries on my supersport after two and half years. No other repairs or maintenance have been required. If you email TGA they can send you contact details for Australian dealers in your area. DeusExMacintosh’s last blog post..Will the last minister to leave, please turn out the lights! That looks like a nice ride, DEM. Unfortunately the price (I can only find pounds) is way, way out of range, and I can’t see any way I could get that in and out of a sedan car boot. I’ve seen a few scooters around here, but none that could be put in the boot of a car. Their purpose seems to be to replace a car. Which is all fine and good if you happen to live close enough to shops and don’t mind risking your life on the roads (some of the footpaths here are either narrow or slanted or non-existent). If you happen to live a little out of town, or up a steep hill, or have children you need to take shopping with you, bad luck buddy. I’m not sure one of these would even fit on the bus that comes around once a week to take (elderly) people shopping. On the plus side they are a fetching shade of maroon. Mindy: scroll down here to see. Wow, mobility doesn’t come cheap. http://www.ilcaustralia.org/home/default.asp They will have a variety of scooters available for play, and information on where to get them. Don’t know if they do home visits! Thanks Variegated, I’ve have several contacts with the ILC. They offered a couple of bits of information, but insist that I attend their centre in person before any more can be dispensed. That’s not going to happen right now (and I’ve had no reply to my question about accessible parking at the centre). Not only is mobility not cheap, most scooters are total crap and designed with little old ladies in mind who might want to pop to the local shops once a week. Not younger disabled people who have active daily lives or (gasp!) JOBS. I’ve yet to see any advertising that promotes mobility scooters as a way to have an active life with your family for example. most scooters are total crap and designed with little old ladies in mind who might want to pop to the local shops once a week. This is fairly close to what I expect to be my usage pattern, despite being neither little, old, nor a lady. I get that some diversity in the kinds of scooters available and the way that they’re advertised would be a good thing, DEM, but you really don’t need to imply that catering to “little old ladies” and their desire to “pop to the shops once a week” (or those whose useage might be equivalent to that, as Lauredhel is pointing out) is a bad thing, or a distraction from those who “really” need access. Accessibility is not a lesser concern for that kind of useage than for catering to those who have “active daily lives or (gasp!) JOBS.” I especially hate the idea that people need to be ‘contributing’ members of the community to be worthy of access to the community. Everyone has the right to their community. When you start belittling someone’s need for access, you’re letting ableism creep in. And really, the phrase “little old ladies” is pretty dismissive of older women. Do we really need to fall in with existing ageism and sexism? Yeah, y’know what? I call FAIL. As do I, WP, as do I. DEM – think before you speak, follow the comments policy to the spirit (not just skating this side of the line all the time), or go away. You’ve been on my last nerve for a while now.